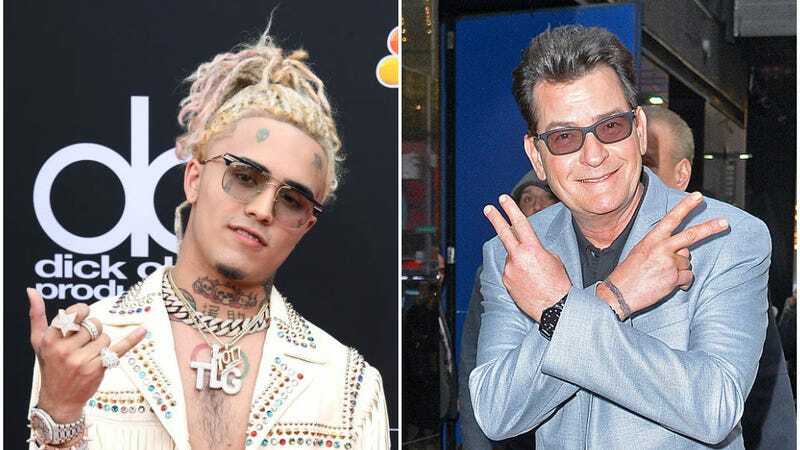 Move over Michael Douglas; take a hike Willem Dafoe; it’s over for you, Jon Cryer in your Two And A Half Men tucked-in golf shirts and khakis—Charlie Sheen has found a new artistic counterpart and it’s ... well, it’s Lil Pump. Obviously enticed by the promise of “all [that] cash,” Sheen responded. A video of the unlikely duo has now surfaced, showing the mildly baffled-looking actor wearing a “Dr. Sheen” costume and allowing Pump’s phone to zoom in on the fancy watch strapped to his wrist for the shoot. “We’re about to make history,” Sheen says near the beginning. The enthusiasm is palpable. Whether the public will be as excited about Sheen appearing in the video for a song called “Drug Addict” as Pump is difficult to say, but, given how terrible the whole “tiger blood” episode seemed for everyone involved, we’re guessing probably not. Still, the collaboration seems like a good career move for Sheen. His latest effort—hawking the “Sheenius” line of THC vape pens—may have looked like a surprising venture just a few weeks earlier, but a Lil Pump collab starts to put it all in perspective.